Does intelligent life inevitably harbour the seeds of its own destruction? Perhaps the strongest voice against the seeding of planets with intelligent life was Jules Mitterand, one of the most talented microbiologists of the time. His argument was that by spreading intelligence through the universe one was inevitably party to the spreading of evil. Those that argued against him agreed with him that evolved intelligence, having developed through the process of scrambling its way to the top of the food chain through violence and deceit, would inevitably carry evil with it. But they maintained that it should be possible to create artificial intelligence that would be devoid of ambition, greed, jealousy and deceit. Others claimed that there was no such thing as universal ethics, and that the question would be irrelevant in the context of other planets. Jules Mitterand himself had designed the Zhongzi in an attempt to create a creature that could not develop the flaws imposed on humans by the process of competitive evolution. The Zhongzi could only live while their paddles went round, which meant they had to be falling. Since they collected the pollen and dust needed for growth and repair in their funnels as they fell, they couldn’t starve to death, neither could they take more than they needed. They could neither collect worldly goods, nor could they win power over each other. They existed to observe, reflect and appreciate. Since they looked more like seeds than animals, he named them Zhongzi after the Chinese word for seeds.The Zhongzi take their name from the word for “seeds” in Chinese. Following a debate about whether evolved intelligent life would inevitably become predatorial, their designer, Jules Mitterand, attempted to create a creature that through its physical limitations would neither be able to develop greed nor ambition. Zhongzi, like the natural lifeforms on the planet of Shian-shenka, reproduce by cloning, the embryo developing on a small node on top of the body. Situated under the embryonic node is an explosive chamber, that activates when the adult reaches the end of his run, to shoot the small embryo up into the atmosphere for a new run. In the last hour of the adult’s run, the embryo is sufficiently developed for the father to communicate with his offspring, giving him one hour to impart the collective intelligence and experience of himself and generations before him. Their experience of the Golden Hour is described in this video. The Zhongzi are designed with enhanced epigenetics, allowing much of the experience of earlier generations to be expressed through the configuration of their genes. Much of the knowledge is passed from father to son in the golden hour came in the form of “songs”. The Zhongzi embed their songs into the memory banks of their clones as an effective way to pass on cultural and historical knowledge. The vast majority of songs created are songs of praise for the planet and the wonders around them. But the songs that are passed on to future generations are historical songs – ballads relating to important events in the history of the Zhongzi. In the Earthen frame of reference the “songs” of the Zhongzi are not songs at all, but a combination of dance and whistling. 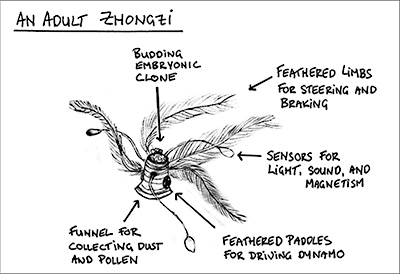 The Zhongzi make music by shaping the wind as it whistled between the feathers of their limbs. They communicate both through movement and whistling, and occasionally through touch.